This is the story of the Owens' travel and life in the Kalahari Desert. Here they met and studied unique animals and were confronted with danger from drought, fire, storms, and the animals they loved. This best-selling book is for both travelers and animal lovers. When Mark and Delia Owens first went to Africa in 1974, they bought a thirdhand Land Rover, drove deep into the Kalahari Desert, and lived there for seven years. 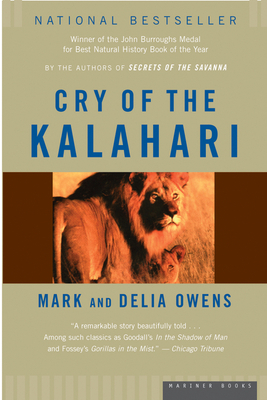 They are the authors of Cry of the Kalahari, an international bestseller and winner of the John Burroughs Medal, The Eye of the Elephant, and Secrets of the Savanna. After more than 30 years in Africa, they returned to the United States to carry on their conservation work.